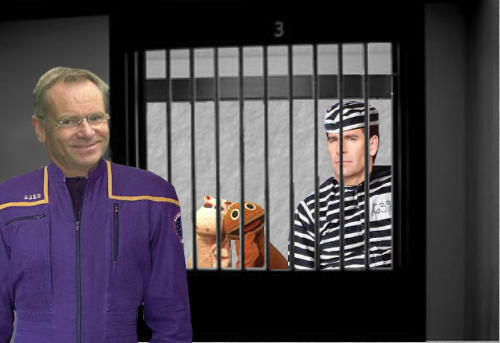 Time travelling Starfleet moralist, Captain Jonathan Archer, has been duped by disgraced former Tory, 'Lord' Jeffrey Archer, into taking his place in prison. Captain Archer's part in the Temporal War now looks at an end after a fateful meeting between himself and possible ancestor Jeffrey Archer. The British novelist, Tory activist and convicted purgurist somehow convinced the gullible Starfleet Captain into believing his two cell mates were enemy agents in the time war. Captain Archer further compounded his error by agreeing to stun the prison guards long enough to swap his uniform for liar Jeffrey Archer's prison garb. Eye witness reports tell of how Captain Archer was then whacked over the side of the head with a fire extinguisher and dumped in Jeffrey's cell. A rude awakening was in store for Captain Archer, trapped with two ex-kids tv presenters from Rainbow, George and Zippy. The puppet duo were thrown in the slammer earlier this year for the brutal murder of co-star talking bear Bungle, whose pelt they sold to big name fan of the kids tv series Roy Skelton. Partly in reference to the fact that they only have one arm, the twosome, one a pink hippo and the other an orange creature who had a zip sown into his mouth for dubious air deprivation stimulation, are known around the Belmarsh high security prison as the One Armed Bandits. Other prisoners have exclusively told the News of the Universes how for the rest of that afternoon all they could hear were echoing cries from Archer's cell, "Ow, Jeffrey! ", being repeated over and over. Jonathan Archer is understood not to have left his prison cell since. 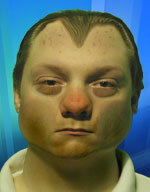 His two cell mates venture out only long enough to smuggle back food for the three of them. Captain Archer is known to have a history with several aliens, including a female Vulcan and a shape shifting alien of unknown gender. As a senior Starfleet officer Archer has also had extensive training on how to be captured and thrown into dank dungeons. It would appear that any similar knowledge on how to break out has alluded him this time. Various reports are coming in from across the timeline that suggest Jeffrey Archer has convinced the crew of the USS Enterprise (NX-01) that he is a Starfleet captain, perhaps even Jonathan Archer himself, and they are now running amok and dining at the best restaurants throughout time.